Congratulations, you’ve reached the final step of the Sith Raid: phase 4. In this phase, you will be facing the whole Triumvirate at once, for a total of about 30m health (all three combined). Because of the mechanics of the different bosses, one team really stands out in Phase 4. Nightsisters – This is the absolute best team you can use in phase 4 right now. Nightsisters under an Zeta Asajj Ventress leadership (full lineup: Asajj(L), Daka, Talia, Zombie, Talzin) will gain 50% turn meter when they drop below full health. Because of all the heals available to this particular faction, coupled with the fact that bonds of weakness deal damage every turn, you can get in some sort of “infinite loop” where you take turns without Nihilus ever moving. That’s in theory, in practice it’s harder to achieve (because of RNG), but you can definitely hope for 7 million damage or higher in the heroic tier once you’ve mastered that team. There is no other team that comes anywhere close to that in this phase. This example was given supposing that all 3 bosses are alive. If one of them is dead (either Sion or Nihilus), or even both, that team will still prevail over other teams, although not to the same extent. Other Teams for Phase 4 – While all 3 bosses are alive, there’s not really any other team worth mentioning. Once Nihilus is down, you can use Jedi led by Revan to kill Sion, if you didn’t have the time to run them in phase 2. Once only Traya remains, you can use Clones (full lineup is Rex(L), Cody, Fives, Echo and Kylo Ren). The goal is to get Kylo Ren to do some big counters. Use unbreakable will on him, and then watch the rest of the team spamming Traya so that she attacks Kylo often. He stacks offense whenever he gets hit, so after a few Traya turns, he’ll counter really hard. Once Unbreakable Will is over, use his second special for one last massive hit, and then finish the run. If Kylo gets isolated, remove it with one of your clones (unlike phase 3, isolate in phase 4 can be cleansed). First Order – KRU lead – The First Order seems to have some use in the Sith Triumvirate Raid, and a Kylo Ren Unmasked lead in Phase 4 of the Heroic STR is effective after Darth Nihilus is down. The team that our Content Director, LJ, has used historically includes a KRU lead with FO Officer, FO Special Force Tie Pilot, FO Executioner and zKylo Ren. Utilizing some of the strategy of getting Kylo to counter this helps get additional attacks in, but testing this team with another FO toon may prove just as effective and allow for both teams to be used. After both Nihilus and Sion have been defeated, the early strategy and one that many deeper-rosters still employ is the “kitchen sink” strategy – throwing the kitchen sink at Traya. Some Rebel combinations can work, especially if you did not have time to use Han and Chewie in earlier phases, and the Wings duo can be somewhat effective as well. Ewoks and Imperial Troopers can also help you add 150k or more to your score if you are fighting for a better rank and rewards. 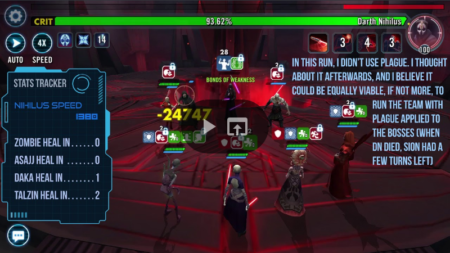 Special thanks to SWGoH GameChanger Skelturix for his fantastic help in ensuring that this Sith Triumvirate Raid guide remains updated and in line with the latest HSTR strategies.